Of course Maori, who lived closely in tune with the seasons in order to anticipate the optimal harvest or hunting times for the animals and plants they relied on for survival. But, for the European immigrants that settled in these islands from two hundred years ago, the landscape would have seemed oppressively green, with little of the seasonal colour that accompanied seasonal changes. 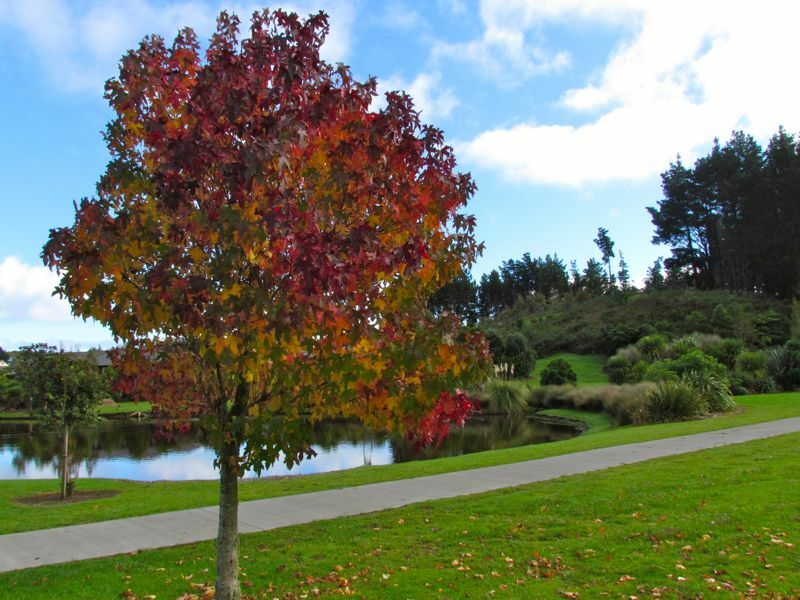 In addition, due to the temperate climate, seasonal changes are less marked, and New Zealand is known more for “four seasons in one day“, than four seasons in one year. I often wonder how environmental perceptions, and indeed, culture, is influenced by the palpability of seasonal change in the landscape. In Japan, for instance, many festivals center on the celebration of nature’s seasonal changes – cherry blossom viewing in spring, and maple-leaf viewing in autumn, for example. But in New Zealand, there are no festivals or celebrations centred on seasonal change (at least that I am aware of). This is understandable, given the nature of our indigenous vegetation and temperate climate, but it strikes me as a pity all the same. When we do observe seasonal change, it is often for pragmatic or economic reasons, associated with agricultural productivity and processes. Nevertheless, I find signs of seasonal change uplifting, communicating directly with one’s spirit rather than one’s intellect. Admittedly, such visible seasonal changes are associated with species of exotic origin – this maple on the estate in which I live, for example. Note how it contrasts against the background of mainly indigenous vegetation. One festival in NZ is the Blossom Festival in Alexandra. And I totally agree with your last sentence – it is more the mark of a sophisticated culture – to realise the fundamental importance and connection that we have with our environment. I was thinking just today about how an awareness of the pragmatic/productive seasonal indicators inspired me to greater wonder and spiritual connection to my home environment. Here in Nova Scotia, the Amelanchier trees are blooming. Also called Serviceberry, Indian Pear, or Shadbush, their blooming is an indication that the gaspereau (shad) are running. We are also just coming into the “strawberry run”, when the wild strawberries bloom, and the striped bass start running. It’s remarkable to consider how these simple, beautiful indicators of “spring” have distinct meaning to the people who still make their living from the land or sea, and how much more complex (and essential) the progression of seasons are to the animals we share our world with. The rising of Matariki, perhaps?